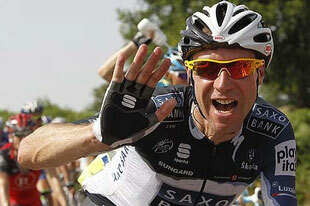 Jens and the "shut up hour"
This is a post about cycling, and an amazing athlete named Jens Voigt. Even if you don't like cycling, you'd like Jens. He's not the best cyclist ever, but he might be the most popular. He is the everyman of cycling, the hard worker who over achieves, the grown man who acts like a little boy and makes everything fun. He's best known for his trademark phrase, "shut up legs" :) He's also had an amazingly long career, which is now, finally coming to a close, at the age of 43. Think of him as the Cal Ripken of cycling. SO Jens just recently "retired", but on his way out the door he decided maybe he'd try to break a forty-year old record, the furthest distance one man can ride in one hour. This record has a lot of history, it has been broken many times since Eddy Merckx set the "current" record in 1972, but by cyclists who were not using road-race-legal equipment. Recently the UCI have reset the record so that only attempts using road-race-legal equipment on the date of the attempt will be valid. Jens is going to attempt to break the record using a legal bike, and if he does - which is quite likely - he'll leave the sport on top, having broken its oldest record. 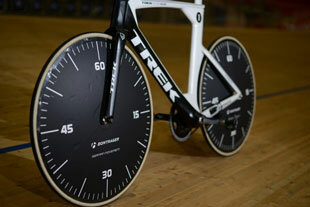 For a lot more about Jens and the Hour record, see this article. Jens is going to make his attempt tomorrow ... GOOD LUCK JENS! They're calling this the "shut up hour", and he's going to have to make a long sustained effort. But because he'll be using "current" road-race-legal equipment, he'll have a significant aerodynamic advantage over Eddy Merckx, and he could well do it. Just having solid disk wheels is a huge advantage. On the eve of his attempt Velonews have published everything you want to know about it, even including his planned playlist. Glad to see Metallica and AC/DC in there! And Europe's "Final Countdown" is perfect for ... the final countdown. 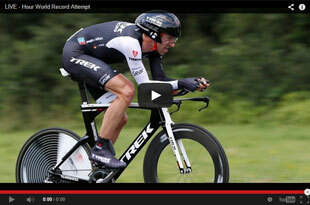 Jens is going to be targeting an incredible 370 watts average, and if he can do it he'll most likely break the record. I for one will certainly be rooting for him... Trek have setup a special page where you can watch the attempt (11:00PT).